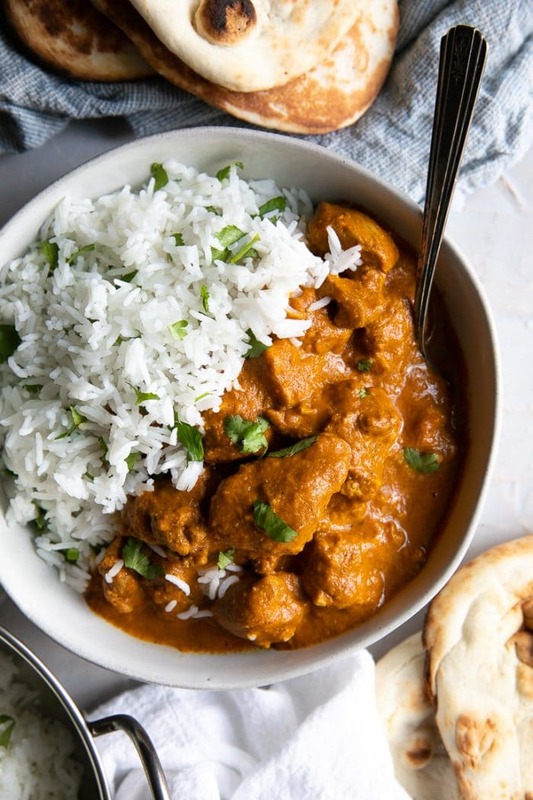 Made completely from scratch, this restaurant-quality Chicken Tikka Masala Recipe is simple, straightforward, and prepared using surprisingly simple ingredients. 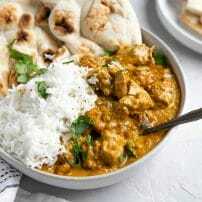 Filled with tender, juicy, marinated chicken pieces swimming in a rich, aromatic, and creamy curry sauce, the whole family will love this classic Chicken Tikka Recipe. Given that my husband is HALF Indian, I have decided it would be fun to add some easy and delicious Indian recipes for all of you to try. After all, I am a huge fan of Indian food and need a place to keep all my favorites stored for safe keeping. I’ve decided to start with a rich, creamy, and utterly irresistible Chicken Tikka Masala Recipe. Super easy to prepare, the flavor in this recipe is HUGE! Easily modified to be spicy or mild, or somewhere inbetween, this recipe is guaranteed to have the whole family asking for seconds. Serve with your white or brown rice, cauliflower rice, a fresh tomato salad, or even this crisp and refreshing cucumber salad to make it a complete meal! To understand what Chicken Tikka Masala is, we first need to understand the difference between Chicken Tikka and Chicken Tikka Masala. Chicken Tikka is an Indian dish that originated in the Punjab region of the northern part of India. Tikka which means “bits” and “pieces” is used to describe small pieces or chunks of boneless chicken that has been marinated in Indian spices and yogurt and then baked using skewers on a brazier. Of course, there are several variations. For example, the Kashmiri version grills the chicken over red-hot coals. Chicken Tikka is typically served with onion rings, coriander, and rice. 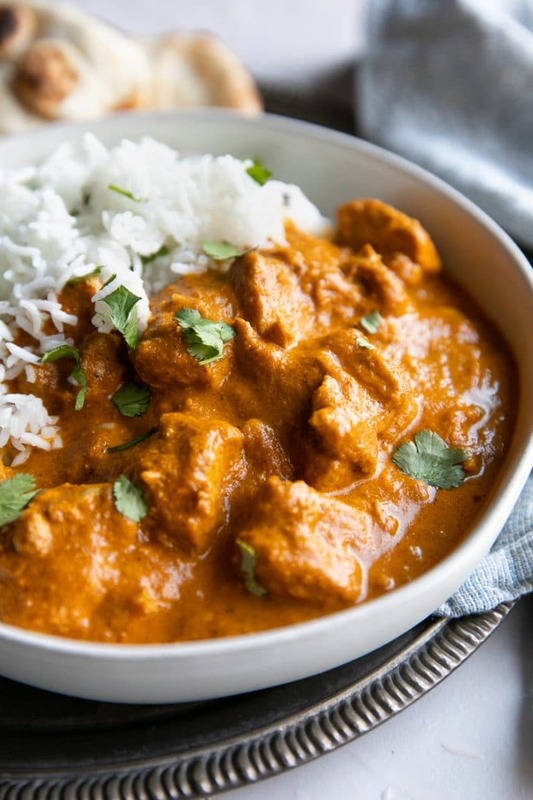 Chicken Tikka Masala, on the other hand, is chunks of Chicken Tikka in a creamy curry sauce that typically contains tomatoes, cream, and several different spices. Is Chicken Tikka Masala Indian or British? The exact origin of Chicken Tikka Masala is greatly debated. While it is known that Chicken Tikka originated in the Punjab region of India, the origin of Chicken Tikka Masala is thought to be somewhere in the UK, including one hypothesis that it was invented by a Bangladeshi chef in Britain or another that it was created in an Indian restaurant in Glasgow, Scotland. In any case, it is said that there are nearly 50 variations of this popular dish and that, although it is known as Chicken Tikka Masala, is often served with lamb, fish, or paneer. What is the difference between garam masala and tikka masala? Some of you may be wondering about the difference between garam masala and tikka masala. After quite a bit of research and several different answers, I have found that while Garam Masala is easy to define, Chicken Tikka and Chicken Tikka Masala (see above) are all easy to define, Tikka Masala is not so straight-forward. I promise I’m not trying to confuse you. These are all questions I’ve wondered about for years, so I figured what better time to get some answers! Garam Masala – Garam (“hot”) and Masala (a mixture of spices) translate to a mixture of spices used to “heat the body”. In other words, garam masala is a mixture of spices that are mixed and roasted and then ground together. This is a dry mixture. While the spices are not necessarily hot in a literal sense, these spices are believed to elevate body temperature in Ayurvedic medicine. 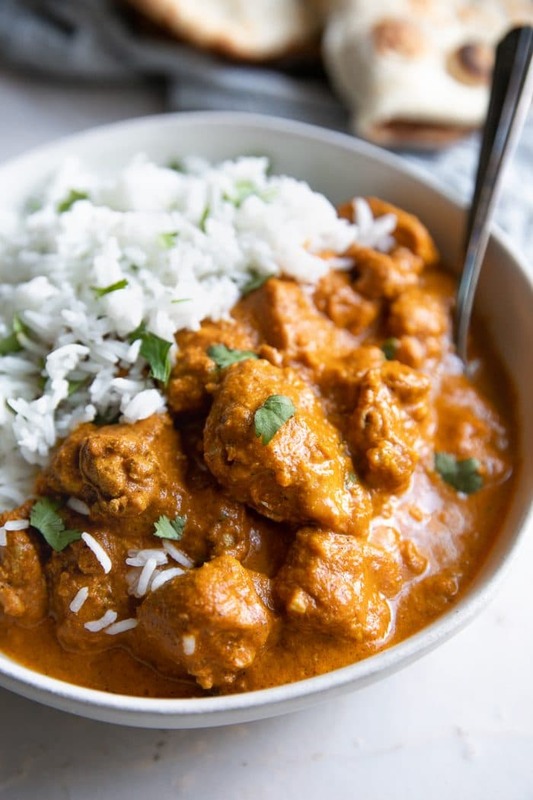 As for Tikka Masala? I literally could not find a definitive answer. I read differing answers based on if you were in the UK or India and then people kept switching between just tikka masala to chicken tikka masala in their explanations so I never really knew what they were talking about. What I do know is this- if you dissect the name Tikka (“bits and pieces”) with Masala (“a mixture of spices”), Tikka Masala literally translates to bits and pieces mixed with spices. Since several (not all- remember how many variations of Chicken Tikka Masala there are out there!) contain Garam Masala, I’m just going to assume that to be Tikka Masala one must contain Garam Masala. You may be surprised to learn that there aren’t a lot of differences between Chicken Tikka Masala and Butter Chicken– aside from one or two. The first, and most important is that Chicken Tikka Masala typically has an overall greater amount of spices. This leads to an overall brighter, more spice-flavored curry sauce. Some believe that Chicken Tikka Masala is meant to include large chunks of boneless chicken breast meat that is roasted or cooked in a tandoor before being transferred to the rich curry sauce. As such, the chicken will typically be greatly charred around the outside. 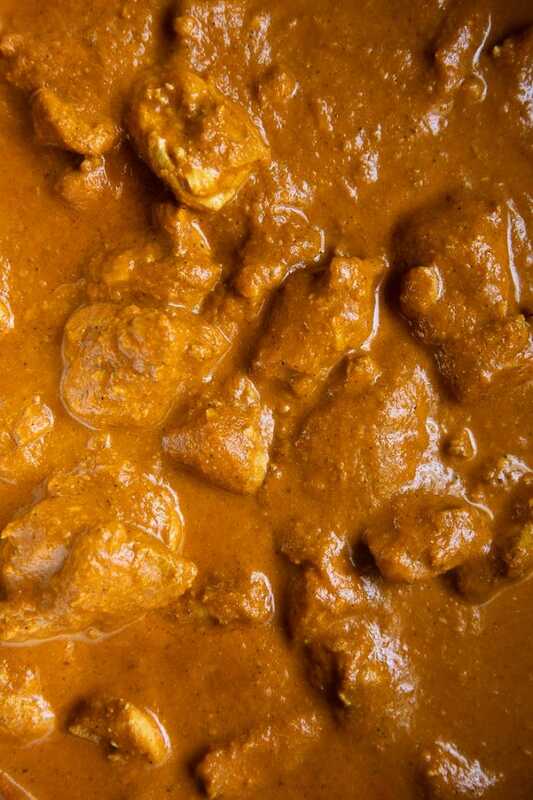 On the other hand, many argue that Butter Chicken is best made with bone-in pieces of chicken thighs or legs. Ok, now that we officially know everything there is to know about this wonderful, though somewhat mysterious British-Indian curry, let’s start cooking! There are two main parts to this Chicken Tikka Masala Recipe- the marinade and the sauce. Traditionally, chicken tikka masala is made by marinating chunks of chicken, usually chicken breast, in a spice-filled yogurt sauce and then grilled or cooked in a tandoor to make beautiful, smoky, delicious chunks of chicken. Since I do not have a tandoor or red hot coals just chilling outside my house waiting to be used, I had to use the next best thing- a skillet and my stove. 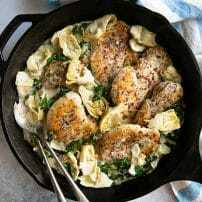 I prepared this recipe in my favorite, go-to, Dutch oven. You’ll notice that it is not a non-stick pan. Although non-stick pans and skillets have their place, I do not recommend that for this recipe. So, chicken thighs, unless you have access to a tandoor, will give the best flavor and texture. You may absolutely use chicken breasts if you prefer, but I highly recommend marinating the chicken for at least overnight for best flavor. The first part of making Chicken Tikka Masala is getting the chicken marinated. This step is essential to the overall taste and flavor of this wonderful dish, so please, don’t skip it – even if you only have enough time to marinate the chicken for 30 minutes or so. So, the chicken has been marinated, now it needs to be cooked. Grab your favorite pan, Dutch oven, or skillet (preferably one with tall sides) and get it nice and hot. Add a generous splash of oil to the skillet and swirl to coat. Add the chicken in a single layer and cook for 2-3 minutes on each side, or until brown and just starting to char. Do not crowd your chicken and do not move your chicken until it has cooked for at least 1-3 minutes and it starting to brown. Each pan will give different results, but assuming you don’t BURN your chicken to death, a little charring is good. Work in batches, as needed, until all the chicken has been browned. Set aside to a clean plate and scrape out any stuck-on charred bits of chicken. Congratulations, you guys! Step two of three is complete. Ok, actually, there are more steps than that, but of the major steps, that was the second. Now, in step three- let’s make the sauce! Return the pot/pan/skillet to the stove. Add some more oil (sorry, not sorry, that’s how curries go) and sauté the onion until soft and translucent. After the onions add the salt and ginger, followed by the garlic and paprika, mixing between each addition. Finally, add the spices (turmeric, garam masala, coriander, cumin, and cardamom powder) and mix continuously to prevent burning. Yes, it will look like a mushy, dry glob of onions covered in spices. Keep going. Stir in the tomato puree and water and bring to a simmer. All of a sudden, that glob of spices starts to resemble a chunky curry sauce. Cover and simmer for 10-15 minutes. 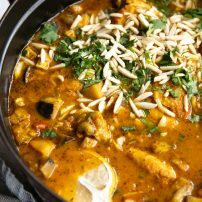 Since curries are typically creamy and luxurious, we want to blend all this up. Transfer to a blender, puree until smooth, and return back to your pot/pan/skillet over medium-low heat. Stir in the cream, sugar, butter, and return the chicken. Return to a simmer and continue to cook for an additional 5-10 minutes. Season with additional salt and cream, as desired. Looking at it, I can understand why it may it may appear overwhelming. But I promise, if you read the instructions and look at the corresponding images, you may surprise yourself! If you marinate the chicken in the refrigerator overnight, allow it to come to room temperature for at least 15 minutes before adding to your hot pan or skillet. 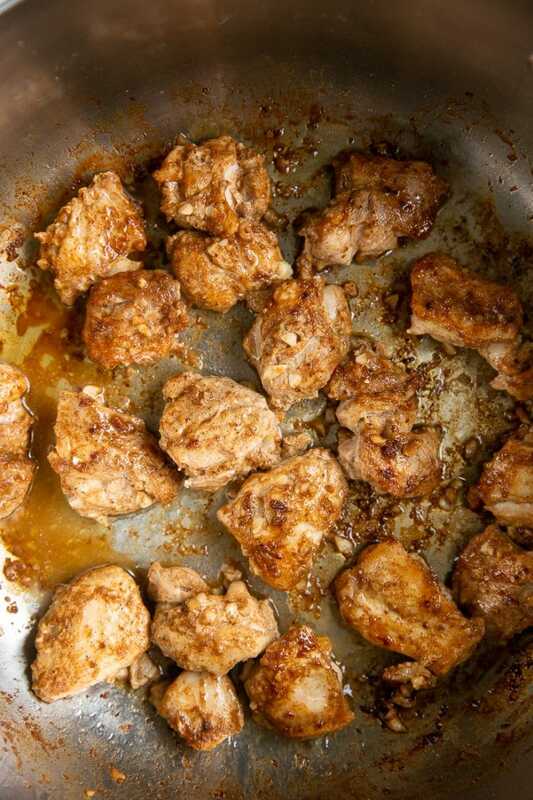 This is especially important if you chose to use chicken breasts instead of chicken thighs. Mild or spicy? 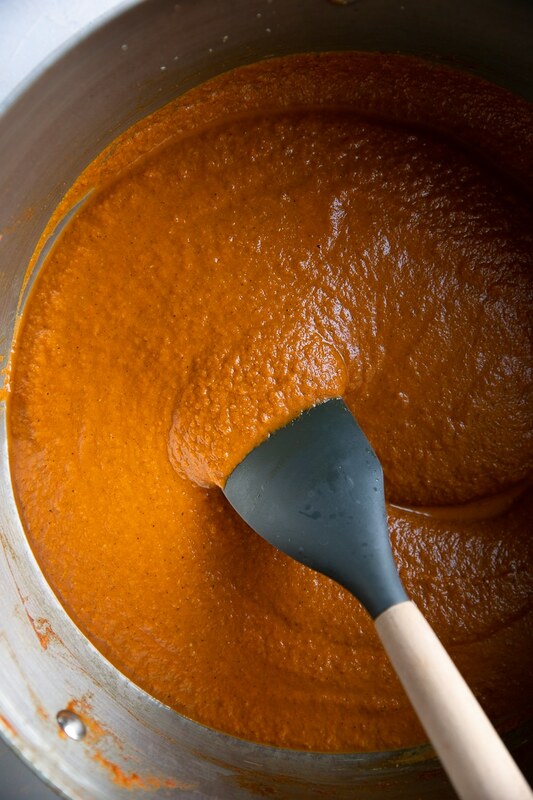 Depending on your heat tolerance, you may choose to make Chicken Tikka Masala either mild or spicy. In my case, I chose to keep it mild because it’s one of Octavian’s favorites. However, add 1/2 or more teaspoons of cayenne powder to kick it up a notch. 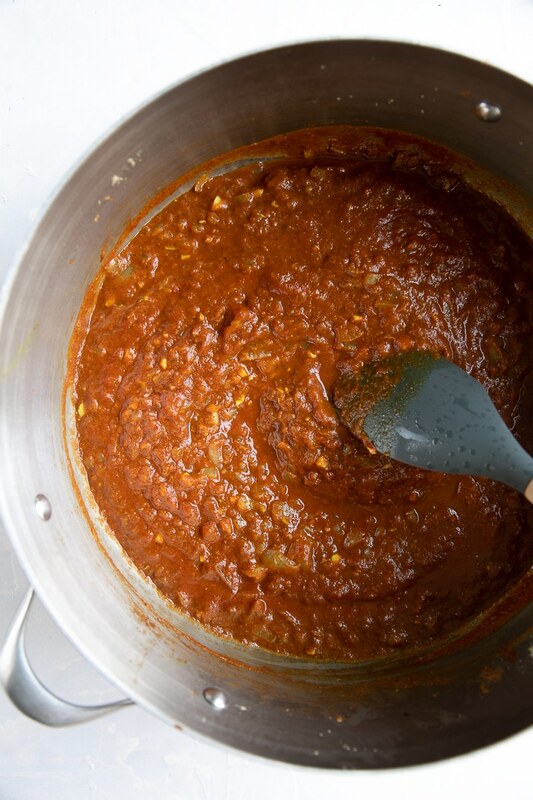 If you prefer a thicker sauce, add a few tablespoons of ground cashews or almonds to the sauce at the same time that you added the tomato puree. Not a fan of chicken? no problem! Chicken Tikka Masala, despite its name, tastes wonderful with lamb, beef, mutton, cauliflower, or even paneer. Is Chicken Tikka Masala gluten-free? Yes! The leftovers are BOMB so definitely hold on to those and enjoy all week long! If you try making this Chicken Tikka Masala Recipe, please leave me a comment and let me know! I always love to hear your thoughts. 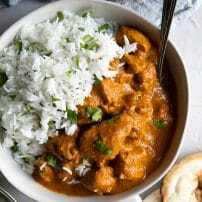 DON’T FORGET TO PIN AND SHARE THIS CHICKEN TIKKA MASALA AND ADD IT TO YOUR NEXT WEEKLY MEAL PLAN! Filled with tender, juicy, marinated chicken pieces swimming in a rich, aromatic, and creamy curry sauce, the whole family will love this classic Chicken Tikka Recipe. 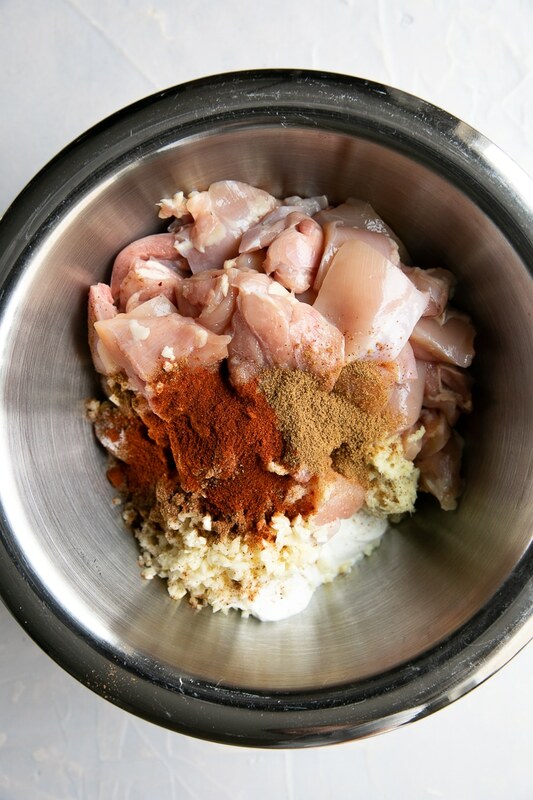 Combine all ingredients for the marinade in a large mixing bowl. Whisk well to combine. Add the chicken and mix well to coat. Cover and allow the chicken to marinate in the refrigerator for at least 2 hours or up to three days. Heat 1 tablespoon of oil in a large pan or skillet with tall sides over high heat. Once hot, add the chicken in a single layer and cook for 2-3 minutes on each side, or until brown and just starting to char. Remove chicken to a clean plate and set aside (do not worry if the chicken is not fully cooked on the inside). Scrape out any charred bits stuck to the bottom of the pan and repeat process until all chicken has been cooked (it took me three rounds). Wipe down the pot, or clean as needed to remove any brown bits that may have stuck to the bottom. Return to medium high heat. Add 1 tablespoon of oil to the pan. Once hot, add the onions and sauté for 3-4 minutes, stirring frequently. Add the salt and ginger and continue to cook for 2-3 minutes, stirring often to prevent the ginger from burning. Reduce heat to medium-low. Add the garlic and paprika and cook for 2 minutes, stirring often to prevent the paprika from burning. Finally, mix in the turmeric, garam masala, coriander, cumin, and cardamom powder. Cook for an additional two minutes, toasting the spices and stirring often. Stir in the tomato puree and water with the onions and spices. Bring to a simmer, reduce heat to low, and cover. Allow mixture to simmer for approximately 10-15 minutes, stirring occasionally to prevent the sauce from burning to the bottom of the pot. 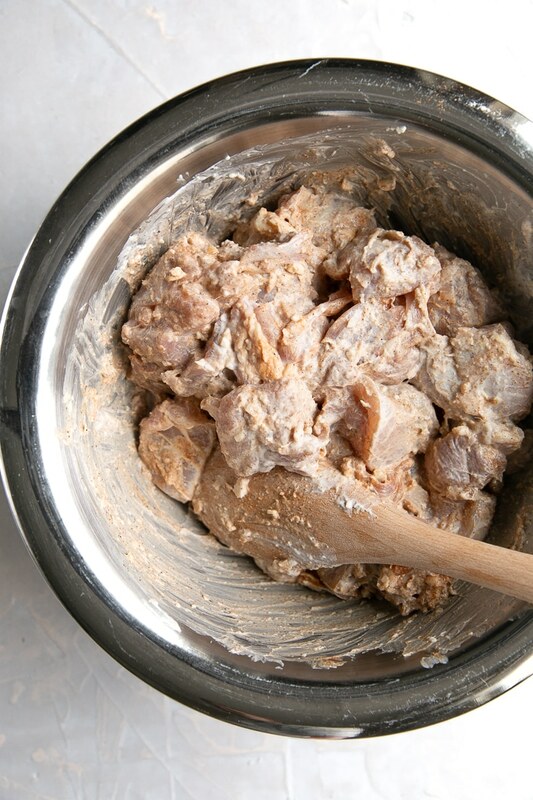 Remove from heat and transfer sauce to a large, high-speed blender. Process until smooth. Return the sauce back to the pot, making sure to return as much of the sauce stuck in the blender back to the pot as possible. Return pot to low heat. Stir in the cream, sugar, and butter. Once the butter has melted, return the chicken to the pot and mix well to combine. Allow the chicken to simmer for an additional 5-10 minutes, or until chicken is fully cooked. Take care not to boil the sauce. Season with additional salt and pepper, to taste. Serve with warm naan or pita bread, if desired. Enjoy!